The Book You Need To Take Your SQL Server Reporting Services Skills From Zero to Hero! 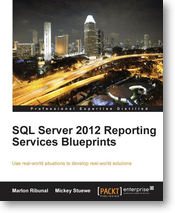 But I am here again to tell you about my book: SQL Server 2012 Reporting Services Blueprints. If you want to learn SSRS or deepen your knowledge about it, you may want to grab a copy of this book. Come visit me on my home-blog: SQL, Code, Coffee, etc.